Just hopping by this Wildlife Wednesday to say howdy and to post a photo of our resident garden bunnies. So far, spinach is the only thing they’ve eaten in the garden. 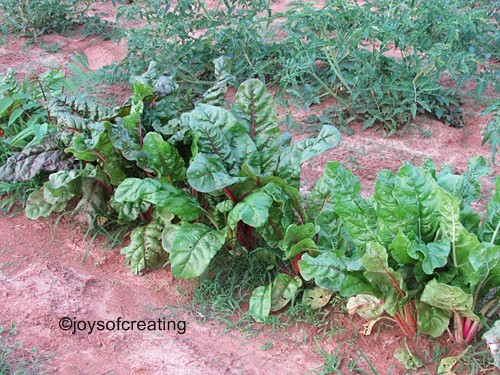 I read that rabbits like to eat chard, but for some reason they haven’t eaten any of our chard. I suppose since these rabbits are wild, they didn’t get the memo on their preferred foods, or it just occurred to me, that they’re saving the chard for their babies. I can see where that they’ve been pulling their fur & that means there’s a nest somewhere snugly & warm built for a litter of kits. This entry was posted in Garden & Yard, Pets & critters and tagged bunnies, chard, gardening, rabbits, wednesday, Wildlife Wednesday. Bookmark the permalink. I love the pictures. I saw one while out biking this week. What fun! It’s fun to see wildlife. It always feels like a gift to me. You can be they’re going to be eating something!!! They’re so cute, it’s hard to be mad at them though. And, of course, that should have been: “You can BET”! lol that was my guess. So, your resident bunnies are having babies – they will all be running amuck in your garden soon! Those tracks do look a bit weird; when you solve the mystery, let us know! You’re right-on. I hope I can get a few photos of them. I do enjoy the bunnies. Cute! That must be the bunny version of crop circles.